The Claddagh's distinctive design features two hands clasping a heart, and is usually surmounted by a crown. The elements of this symbol are often said to correspond to the qualities of love (the heart), friendship (the hands), and loyalty (the crown). 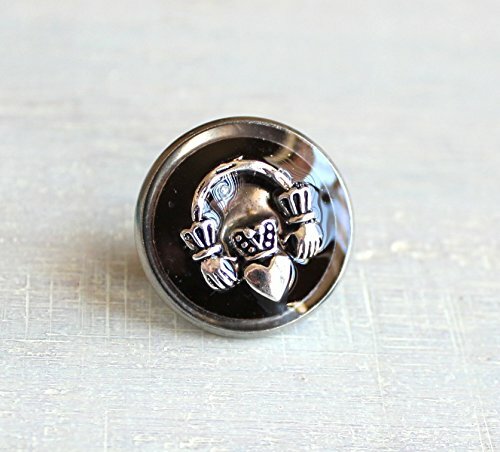 This Claddagh tie tack / lapel pin, in black and crisp silver, epitomizes the symbolism with this sign and is the perfect gift for a loved one. Now you can give them a little luck of the Irish whether you are dressed for everyday or for a special evening out. This can also be worn as a pin, make sure to check the measurements as it's a little larger than a regular tie tack. Measurements: Claddagh pin / tie tack is 0.75 inch (1.905 cm.) around. I create items I love - with love - and I want to share them with the world because I believe they are worthy, and they will make someone's life better, brighter, easier, and happier. **Each pin is individually, made by hand, by me. That means there will be slight color variations and that things won't look perfect or machine made. These are not flaws. I feel they add to the beauty of each piece. If you have any questions about this product by Nature With You, contact us by completing and submitting the form below. If you are looking for a specif part number, please include it with your message. Blue celtic knot tie tack / lapel pin. Royal blue Scottish thistle tie tack / lapel pin.